Aggies Do It Better: AGGIE WEEK! 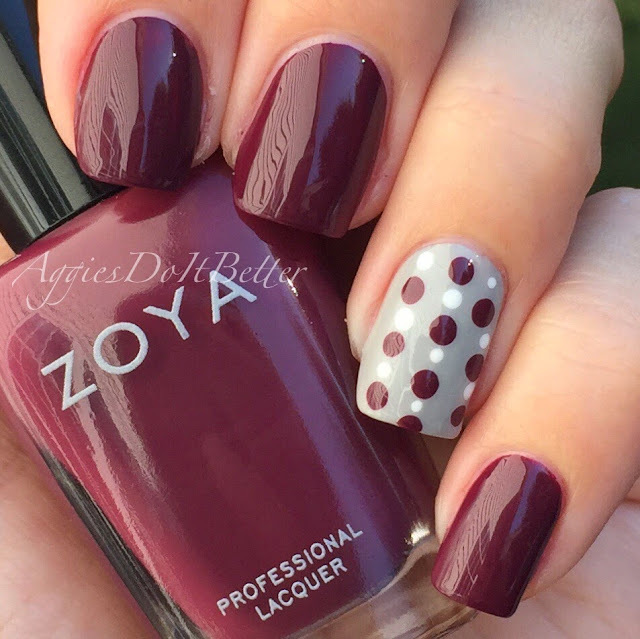 Day 1, featuring Zoya Toni and polka dots! Hey guys! I'm so excited for this! These posts have been months in the making....I just haven't had time to do it the way I wanted to, the right way! My goal: to showcase my absolute favorite maroon polishes, that I have currently, as well as create some cute, easy to do looks for game days or any Aggie function! Some are easier than others, but I think you will find some on every skill level! I am also keeping the accents to just one nail, because I want to showcase the polish as well. But you could absolutely do it on every nail! I'm sure I will probably be saying this every day, but this one is probably my favorite. Zoya Toni. I don't think its part of the core collection but its available on their website, and they are always having promos. It retails for $9, but if you catch the promos there's really no reason to ever pay more than $5 for Zoyas! Toni wins for color and FORMULA. Guys, it's just a dream. It could EASILY be a one coater, although I use 2 for durability. I have had no issues with staining either after removal, and I try really hard to not get any on my skin during application! For the accent I used a base of Zoya Dove, a really pretty light gray, and Zoya Purity for the white. Here is the sped up Instagram version of the video tutorial for the dot nail! I used a dotting tool (my dotting tools are actually embossing tools I got at Michaels or Hobby Lobby or some such) but dotting tools are widely available online or at Sally's. Or you can get creative with things from the craft store like I did OR you can use things around the house like tooth pics, pins, bobby pins, pencils (sharpened) or whatever! To make the dots, just blob some polish from the brush onto something like a plastic lid or something non-absorbant. Use the dotting tool to tab in the blob (so scientific right!) and then dot on your nails. If it starts to get stringy just wipe the tool on a cloth or paper towel and have another go.